We present an interactive system to create 3D models of objects of interest in their natural cluttered environments. A typical setting for 3D modeling of an object of interest involves capturing images from multiple views in a multi-camera studio with a mono-color screen or structured lighting. This is a tedious process and cannot be applied to a variety of objects. Moreover, general scene reconstruction algorithms fail to focus on the object of interest to the user. 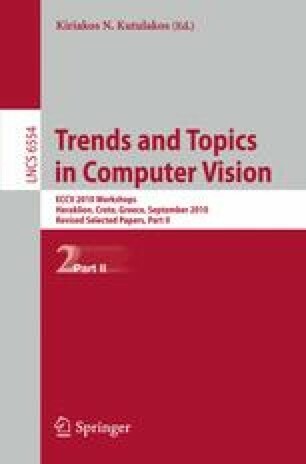 In this paper, we use successful ideas from the object cut-out literature, and develop an interactive-cosegmentation-based algorithm that uses scribbles from the user indicating foreground (object to be modeled) and background (clutter) to extract silhouettes of the object of interest from multiple views. Using these silhouettes, and the camera parameters obtained from structure-from-motion, in conjunction with a shape-from-silhouette algorithm we generate a texture-mapped 3D model of the object of interest.